We received this photo from Linda in Palo Alto, California and couldn't wait to share it. She writes, "Since I got my new shoes I've worn them daily! I've decided to buy only one more pair in black and they will be officially the only shoes I wear". 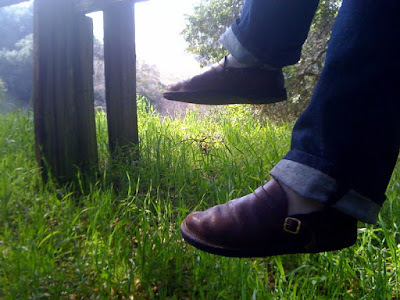 This picture of Linda's feet was taken while hiking at the Stevens Creek Reservoir in Cupertino, California. Don't you just want to be lounging in that sunlight too? In Aurora we're surrounded by gray skies and snow, so this already beautiful picture looks especially wonderful. Thank you, Linda, for sharing your gorgeous photograph.